The Husky 52 in. 9-Drawer Mobile Workbench features heavy-duty double-wall all-welded steel construction and a solid hardwood top for durability. This workbench includes 9 spacious drawers to provide plenty of storage for your tools and the ball-bearing slides ensure smooth drawer operation. This cart comes pre-installed with 4 casters (2 swivel and 2 rigid) that can bear up to 1,000 lbs. 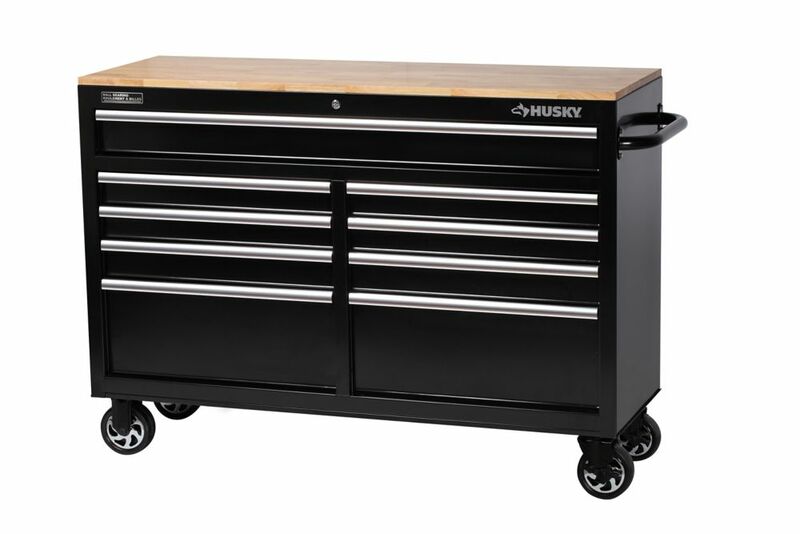 52" 9-Drawer Mobile Workbench with Solid Wood Top The Husky 52 in. 9-Drawer Mobile Workbench features heavy-duty double-wall all-welded steel construction and a solid hardwood top for durability. This workbench includes 9 spacious drawers to provide plenty of storage for your tools and the ball-bearing slides ensure smooth drawer operation. This cart comes pre-installed with 4 casters (2 swivel and 2 rigid) that can bear up to 1,000 lbs. 52" 9-Drawer Mobile Workbench with Solid Wood Top is rated 4.5 out of 5 by 553. Rated 4 out of 5 by bludogs from great for the intended use the purchase was made Bought 2 of these and put them back to back for my wife. These are use to store all her quilting tool, patterns and some material. I added a larger top to facilitate the adding a cutting mat. These are the ideal height to work on and can be moved about her sewing room if the need arises. Rated 5 out of 5 by dms78 from Solid piece of furniture. Love the spacious surface and... Solid piece of furniture. Love the spacious surface and wheels for mobility. Very good value. Rated 5 out of 5 by HomeDepotCustomer from It was very easy to assemble. Order was processed and... It was very easy to assemble. Order was processed and delivered to store as expected. The CONROE store was very accommodating in storing the unit until we could pick it up. Can you bolt a vise to the top? If you are willing to drill holes into the top, I don&rsquo;t see why not. Does it have soft close drawers ?? Is the wood top waterproof and secured to the body? Or is it sitting loose? Is it prone to warping in moist environments? The top is secured to the body. I have two units and they are in my garage. I have not noticed any warping nor do i expect to see any. Do the drawres lock when closed? Wondering if place on an unlevel surface if they will stay closed. Yes they will come open, you would have to lock the draws in place with the lock. Does the 52.4 inches width measurement include the handle or not? It does not include the handle. It's frame only. Yes all drawers are completely removable.